Loosely adapted from Plato’s symposium, I Know You So Well examines the fracture of an industry or place. Our first iteration, commissioned by Artspace New Haven, focuses on healthcare. It brings healthcare workers together who likely never connect in their professional lives to think holistically about what it means to heal. 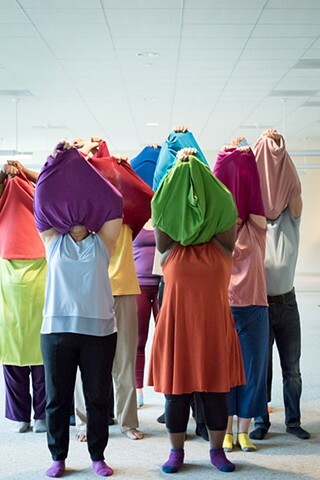 This interdisciplinary work layers song, text, choreography and improvisation to convey the emotions and life-experiences of an unlikely group of performers. In bringing together this intergenerational, diverse group of strangers from the New Haven area, this choir will allow improvisational elements and variance of meaning to shape our understanding of the work of caregivers, what it means to give care, and to discover what we can learn from each other's isolated practices. Performed on Yale’s West Campus in West Haven, adjacent to the Yale School of Nursing and the site of a former pharmaceutical company. I Know You So Well is an Artspace commissioned project for Wellbeing: City Wide Open Studios 2018. This project is supported, in part, by the Community Foundation of Greater New Haven, a Foundation for Contemporary Arts Emergency Grant, The New England Foundation for the Arts New England Dance Fund with generous support from the Aliad Fund at the Boston Foundation, Marianne Bernsen, and an anonymous donor.